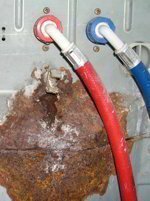 As an engineer with over 40 years experience I have useful advice and tips to help you connect a washing machine up and avoid some problems. You should already have the plumbing available. Plumbing in a washing machine is a plumbing issue not covered here. A new washing machine will arrive fully protected for transit. Not only externally, but internally too. Special transit packing is installed inside the washing machine to hold the tub solid and prevent it moving about. If used without removing the transit packaging the suspension will be locked and the washing machine will bounce around and shake on spin potentially causing damage. Is it hard to install a washing machine? It should normally be very straight forward, with no specialist knowledge or tools required. It’s just a matter of removing the transit packaging as instructed in the instruction book (or on a leaflet taped to the washer) and then screwing on the fill hose(s) and connecting the drain hose to the waste water system. It’s important to make sure the washing machine is nice and level so that it doesn’t rock around on spin. Check that it’s level not only across from left to right, but from front to back. In other words makes sure it doesn’t tilt forward or back as well as being level. If it tilts forward it’s possible for water to leak out of the soap drawer in certain circumstances. These days most washing machines have adjustable feet, at least at the front. Sometimes a spanner for adjusting the feet comes with the machine. The best thing is to try and tip the machine back slightly whilst you adjust the feet which will make it considerably easier to screw them in or out. Once level many have locking nuts to tighten up which should prevent them loosening up. If locking nuts are fitted it will be necessary to undo them before you can screw a foot in. If by any chance the feet are not adjustable and you have a rocking washing machine you will need to wedge something under to level it, cardboard, folded paper or a proper wedge will all do but most will be subject to needing occasional adjustment as movement of the washer may move it. If you don’t have a spirit level then the best you can do is try to make it so it looks level and doesn’t rock side to side or front to back. However, if you have a smart phone you may be able to download a spirit level app. I have a great one on my iPhone called Dual Level Pro, which once calibrated is excellent. Unfortunately though, you ideally need a spirit level to check a particular surface (like a desk, table or kitchen worktop) is actually level so you can place the phone on it and calibrate it before you first use it. You could still try assuming one of these places is pretty level though. Can I use the old washing machine hoses or should I fit the new ones? Washing machine hoses can last much longer than washing machines these days. If you are sure the old ones are in perfectly good condition you could leave them in place and keep the new hoses as spares, particularly if the new fill hoses aren’t as long as your old ones and won’t fit (which is common). Personally, I prefer to fit the new hoses if I can though and have to advise it is best practice for obvious reasons. How tight should I connect the fill hoses? It’s very common for people to over tighten them. Over tightening makes them more likely to leak, which is counter-intuitive. This is because it cuts and damages the rubber seal between the water valve and the hose. Make sure you don’t cross-thread the connector (I’ve always preferred to lightly lubricate the thread on the hose with WD40 which makes it easier to screw on but this isn’t necessary). Tighten the hose finger tight. Once firmly finger-tight I then tighten it just a fraction more. I would describe it as screwing the hose about 2 – 5 mm tighter than I got it by hand – but if you have a strong grip it may be unnecessary to tighten it further. I tighten with pipe pliers. You aren’t supposed to use pipe pliers because you can easily over do it, but I always do (although delicately). If I don’t have pipe pliers I use a cloth to get a little extra grip. Remember, if you over tighten you can cut the thin rubber washer inside which will start to leak – not always instantly. Check for leaks, and check again at least several minutes later before pushing the washing machine back. A hose connection can appear watertight at first, but start dripping after several minutes or longer, or after moving the washer back into place. Once the washer is back in place you can’t usually check so you need to make sure there are no slow drips. A very slow drip can continue unnoticed for years and cause damage. Keep checking the connections at the tap end if the taps are visible once the machine is in place. Keep an eye on them over the following days as I’ve had many which stared to drip when they were perfectly fine when checking at installation point. Fill Hose not long enough to reach washing machine? When you push the washing machine back in place make sure you don’t kink the fill hose(s). If no water comes into the machine or it comes in too slowly check you haven’t kinked the fill hose. Check out Part 2 – How to install a washing machine drain hose which looks at the drain hose and issues with water pressure. hello David. Either the rubber seal at both ends of the hose is missing, not seated properly, or damaged. One of the biggest causes of leaks on washing machine fill hoses can be over tightening. If you over tighten a hose then the small rubber seal can get crushed and cut. Make sure the hose is tight but only as tight as you can get it by hand.